With the assistance of our adroit team of professionals, we are offering Socket Head Cap Screws. The offered cap screw is designed by using supreme quality steel and leading technology by our workforce. 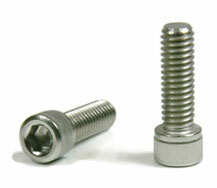 This cap screw is used as alternative to flywheel cowling and pan head screws. Offered cap screw is checked on various stages by our quality controllers for ensuring quality. RKC provides consistent quality products with high precision to suit your requirements. We offer full range of Industrial fasteners Viz: Hex Bolts, Flange Bolts, Nuts, Socket Products, and Screws.